Email marketing continues to be the best digital channel for ROI, so delivering dynamic, personalized messaging to the inboxes of your customers is of the utmost importance. In fact, for 77 percent of consumers, email is the preferred messaging channel, dwarfing demand for SMS, push notifications and social media communications. When you are determining the right email marketing strategy for your business, it’s natural to wonder how the industry leaders are conducting their campaigns. A­er all, if they’re on top, then they must be doing everything right...right? 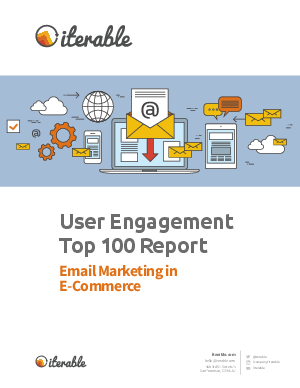 To glean best practices, we analyzed the email marketing strategies adopted by the top 100 e-retailers in the United States to study how they engage with their customers. These companies represent industries ranging from apparel and electronics, to auto parts and pet supplies, but all have the single goal of getting their users to go from inbox to checkout. We note what companies are doing across the board, as well as what specific e-retailers are doing right and what they can do to improve, using case studies to make recommendations about how to improve the email marketing of your own organization.